VaporFi e-cigarette products have been designed for smokers who are 18 years of age or older. If you live in states such as New York, Alabama, New Jersey, Utah and Alaska you must be 19 years and over. However, it is wise to check the legal smoking age in your state as it applies to electronic cigarettes. VaporFi offers innovative, dynamic alternatives to traditional cigarettes. Though many people have successfully used these products in efforts to quit smoking, electronic cigarettes have not yet been approved by the FDA as devices designated for smoking cessation. As a result, we are prohibited by federal law from marketing our products as smoking cessation devices & they should not be used as such. It’s also advised that you consult your doctor before use. What is the VaporFi difference? VaporFi products were designed for the discerning e-smoker. They are made with much attention to detail, to please those who want the very best experience they can have. They are made for those who are not afraid to get out of the box when smoking. VaporFi is for smokers who are looking for advanced models that give them the ability to control every aspect of vaping need to get into the VaporFi! Do VaporFi e-cigarette products produce smoke or tar? No. That’s the beauty of e-cigarettes. They contain no tobacco, and nothing gets burned when smoking them. They consist of liquid that gets vaporized; no smoke or tar involved. Why is VaporFi better than the rest? VaporFi electronic cigarettes are revolutionary, both in relation to traditional cigarettes and the majority of other types of electronic cigarettes on the market. They are immensely innovative, giving users far more options than ever before available with traditional cigarettes and beginner’s e-cigarettes. None more settling: the time has come for you to own the whole smoking experience. Just like traditional cigarettes, you have the ability to smoke by inhaling and inhalable nicotine. That however, is where the similarities end. Just like other (less advanced) e-cigarettes, they contain no tar, ash, tobacco, flame, carbon monoxide, smoke, or the offensively foul odors they produce. Can I smoke anywhere with VaporFi Electronic Cigarettes? Practically, but it really depends on where you are. Most vapers find they have far greater freedom with electronic cigarettes, and very few places have any interest in stopping smokers from enjoying their e-cigs if they aren’t offending anyone. Because they produce no first or second hand smoke, and they are not at all traditional cigarettes, you’ll be able to vape in most places prohibited to smokers. Are VaporFi Electronic Cigarettes a better way to smoke? VaporFi’s revolutionary smoking alternative allows for a smoking experience sans tobacco, so all the trappings of tobacco are nonexistent. There is no proof authenticating their health value, so you’ve got to use your judgment. Smoke free, tar free, chemical free, and tobacco free; what do you think? I'm new to this, what do I need to get started? First, you will need to purchase a starter kit. Our starter kits come with everything you will need to begin in terms of parts. After you figure out which model starter kit you wish to purchase, you will need eLiquid to fill your cartomizers. All of our cartomizers are refillable with eLiquid. We suggest purchasing 2-3 bottles of eLiquid in various flavors and strengths in order to find the one most suitable to your preference. An electronic cigarette, e-cigarette, e-cig or vaporizer cigarette is a battery-powered device that provides inhaled doses of nicotine or non-nicotine vaporized solution. In addition to purported nicotine delivery, this vapor also provides a flavor and physical sensation similar to that of inhaled tobacco smoke, while no smoke or combustion is actually involved in its operation. In automatic models, when a user inhales through the device, air flow is detected by a sensor, which activates a heating element that vaporizes a flavored liquid solution stored in the mouthpiece, which may contain nicotine. On manual models, the user must depress a button to activate the heating element to produce vapor which is then inhaled by the user. On most models an LED on the opposite end of the device is also activated during inhalation, which serves as an indicator of use. The cartridge is a small tube which attaches to the battery. The cartridge which holds an absorbent material and wire coil that is saturated with a flavored liquid solution. The level of nicotine varies depending on the solution. This inner cup is made such that air is able to flow around it and through a hole in the end of the outer piece; this is necessary for the device to provide the ability for suction to move the vapor into the user's mouth. When the liquid in the cartridge has been depleted, it can either be refilled by the user or replaced with another pre-filled cartridge. The cartomizer is a tank system which holds anywhere from 1.5ml – 3.0ml of liquid. Inside the tank is an atomizer with wicks that draw the liquid to the atomizer which vaporizes the liquid. When the liquid in the cartomizer tank is depleted the cartomizer tank can be refilled. The atomizer heads are replaceable and need to be replaced regularly. Resistance is a term that describes the forces that oppose the flow of electron current in a conductor. Resistance is measured in units called ohms. The scientific definition of one ohm is the amount of electrical resistance that exists in an electrical circuit when one amp of current is flowing with one volt being applied to the circuit. Great but what does this have to do with an Ecig? With some of our cartomizers, we offer a resistance/ohm option. Basic explanation: The lower the ohm, the quicker the atomizer heats up. This translates to more vapor and possibly shorter lifespan and increased chance of experiencing an unpleasant burnt taste. Generally speaking, low resistance atomizers (1.5-1.8ohm) are intended to give the user an experience similar to a higher voltage setup (4.3V-6V) using standard voltage output batteries (3.2V-4.2V). Resistance is not as important when using a variable voltage device because the user is able to increase or decrease output voltage accordingly. However, this is not always the case. With dual coil cartomizers, we recommend 1.5 ohm - 2 ohm for 3.2V-5V devices and 6V for anything above 2 ohm. How do I care for my electronic cigarette? Drain every 2-3 days to maximize vapor production and lifespan: Remove the cartridge from the atomizer. Roll up a piece of tissue and insert it half way into the atomizer in place of the cartridge. Then blow into the hole located in the end of the atomizer that connects to the battery. Use canned air if available. This should force all the excess liquid from the atomizer into the tissue. After draining the atomizer, add 1-2 drops of eLiquid directly into the atomizer when you are ready to use it again. Most atomizer heads can be rinsed in hot water and reused. Charge batteries for 4-5 hours initially. All atomizers leak into the battery contact (the threaded part that connects to an atomizer). Periodically clean the battery contacts using a Q-Tip and always before charging the battery. Detach atomizer from battery when not in use. An atomizer can leak liquid. Liquid in the battery can cause it to malfunction. eLiquid should be stored in a cool, dark area away from direct sunlight. eLiquid, cartridges, atomizers, and e-cig's in general may contain nicotine and should be kept out of reach from children and pets. How do I refill my cartomizer tanks and cartridges? How do I replace my atomizer heads? Be sure your batteries are fully charged. When you insert your battery into a charger, the battery light should blink several times and the charger light should change from either green to red or blue to red (varies depending on model). When the charge is complete, the light to return to its original color (usually green). This LED light may pulse in red, green or blue even when charge is complete. This is normal. If the battery LED does NOT light up AND no vapor is produced when you attempt to use it, this usually means that it needs to be charged or the battery is faulty. Charge the battery and try again. If you suspect that an cartomizer is faulty, test it using other batteries. If this cartomizer will not work with any batteries then it is probably faulty. If it will work with one battery but not the other, then the problems lies in the batteries. Be sure cartridges are properly filled with liquid. Poor vapor production: Add 1-2 drops of liquid directly into the atomizer. If this does not help, try draining the atomizer (see above article for instructions). Take long and slow inhalations to produce more vapor. This gives the atomizer more to to heat the eLiquid. Poor vapor production from new atomizer: Some atomizers need to be "broken in". To do so, simply use the atomizer for 1-2 hours. You should notice improved vapor production with use. Draining and refilling the atomizer may shorten "break in" time. Atomizers will begin to produce less vapor and perform poorly when they near the end of their lifespan. Try preheating your atomizers. Hold down the button on your (manual switch) battery for 2 seconds before inhaling. Take longer and slower inhalations. 1) Does the button LED light up when you push it? IF YES: Then try testing the battery with multiple atomizers. If you've tried several working atomizers and it does not produce any vapor, the battery might be defective or you're experiencing a contact issue. IF NO: The battery might be locked. Most Ego Batteries have a button lock/unlock feature. To unlock the battery, push the button 6-7 times within 1.5 seconds. The button will flash indicating a switch in modes. 2) Does the button LED flash or light up when it is attached to a charger? IF YES: Fully charge the battery. The charger light will turn red during the charge and back to green when the charge is complete. Once the battery is fully charged, if it still does not power any atomizers, then it might be a contact issue (usually due to over-fastening). IF NO: It could be a contact issue, defective charger or defective battery. For contact issue, see video below. If the charger works on other batteries, then it's probably not the charger. Which eLiquid should I buy? I am searching for a flavor that resembles the brand that I smoke. Most eLiquid tobacco flavors are slightly sweetened and do not taste like cigarettes. As you begin to use an e-cig, you will see what I mean. We recommend purchasing 2-3 bottles of various flavors to find the flavor most suitable for you. Why am I experiencing a harsh burnt taste from my device? Solution: If you are able to locate the wire coil (usually right under the mouthpiece), add 1-2 drops of eLiquid directly onto the wire-coil and let it soak for 15-30 seconds. This should resolve the issue. If the burnt taste comes back, repeat the steps mentioned above. For most atomizers, it is necessary to repeat this several times until the atomizer is properly "broken-in". When you first fill the tank, let it sit for 5-10 minutes before using it. Wait until the rope wick turns from white to a clear, translucent color. The rope wick needs time to soak and draw liquid onto the wire-coil. This is known as "priming" and will help avoid any burnt tasting vapor. What exactly are the effects of nicotine? Nicotine has an uncanny, extremely pleasant range of sensations including calmness, relaxation, and an additional sense of alertness. Nicotine is an addictive substance, as you are most likely aware. The effects can last anywhere from a few minutes to several hours. In terms of carcinogenic properties, pure nicotine that has been removed from the tobacco plant has not been officially evaluated by the International Agency for Research on Cancer/ IARC. How long does each cartridge last and how does it compare to traditional cigarettes and other types of electronic cigarettes? VaporFi products offer both cartridges as well as the ability to fill your own liquids. 1 cartridge is equivalent to roughly 350-400 puffs, while liquids have an even longer lasting ability. Generally speaking, there are about 20 drops of e-liquid per ml and each drop is estimated to produce about 5 puffs or roughly 3,000 puffs per 30ml, however it does vary from person to person. Talk about going a long way! Can I select the flavor and strength of my liquid? Yes, absolutely. One of our standout features is that we offer an incredibly large selection of flavors, and give you the ability to mix them as you please to come up with your own varieties. What is the right Nicotine level for me? This really depends on how frequently you use it. On average a 30ml bottle will last 7-10 days. The ingredient in eLiquid that causes it to vaporize in heat is PG, VG or a combination of both. Most eLiquids contain PG, VG, water, flavorings and nicotine. We carry a 70/30 PG/VG blend. How many drops of fruit sweetener or flavor enhancer should I use? Will the fruit sweetener or flavor enhancer perform in any vaporizer tank system, such as dual coil, single coil, or sub ohm tank? YES, these enhancers accommodate all vape scenarios. NOTE: The difference in flavor may be more intense on higher wattage vape devices. Can I mix both the fruit sweetener and the flavor enhancer into my e-liquid at the same time? What is the VaporFi Grand Reserve collection, and who is it for? The Grand Reserve Collection is VaporFi's elite collection of e-liquid. Expect excellence in vaping with the richest flavor chemistry and most intensely voluminous vapor production. While beginner vapors love our Grand Reserve Collection, this line is highly favored among the dripping community. What Flavor and ingredients are in the Grand Reserve e-liquid collection? The Grand Reserve Collection contains secret recipes that are handcrafted to perfection by our expert Vapetenders, so expect delicious flavors and the ultimate vaping experience. The ingredients in each bottle are: USP Certified Propylene Glycol, USP Grade Vegetable Glycerin, USP Grade Nicotine (not in 0%). What different nicotine strengths does the Grand Reserve collection come in? If I'm new to dripping, what nicotine strength is recommended to start out with? Can I use the Grand Reserve collection e-liquids with any vaporfi tank? Absolutely, the Grand Reserve collection E-liquids are designed to be a perfect match for any of your VaporFi tanks. How are VaporFi e-cigarettes different from other e-cigarettes? These are not your run-of-the-mill e-cigarettes. They are high performance, high quality models that end the limitations common with other types, giving you a more intense experience and greater control of everything. VaporFi batteries are rechargeable and they are far superior to beginner’s models. They produce a much greater quality and quantity of vapor, and the flavors are exceedingly more powerful. They take the experience of vaping further, and were made for vapers who want more than prefilled cartridges that are available in limited flavors. How do VaporFi products work? VaporFi electronic cigarettes allow you to simulate the smoking experience, recreating the pleasure of smoking a cigarette in a format that gives you total control. In the simplest terms, specialty E-Liquid is filled into the cartomizer, which then gets sealed shut. A button is pressed to turn on the e-cigarette battery, which signals the e-cigarette to vaporize the liquid, and then you smoke just like you would with any other e-cigarette or traditional cigarette. What is the battery life of VaporFi Electronic Cigarettes? It really depends on individual usage, and how the battery is used. At full charge, a battery should last a full day’s worth of vaping. We carry different battery sizes, and they obviously have different life spans. Every battery contains an LED display indicating battery capacity and when it will need to be recharged. How will I know when my battery needs charging? Your battery will let you know. VaporFi batteries have been designed to go great distances, and even have a power-saving feature known as “hibernation” which enables them to go into standby mode. Please allow 2.5 hours for your batteries to reach 100% capacity. How can I maintain my battery so that it lasts as long as possible? In daily use, it is really important to keep your batteries safe from falls and dropping them, especially on hard surfaces. When transporting them, carrying cases are ideal so that they run no risk of accidents or hitting other objects that could cause damage. Batteries should be charged before they are completely drained of power (you know, getting to 0%). When your battery is getting low, charge it up to 100%. Just this action alone can enable your battery to last as long as possible in the long run. This is one of the most important reasons having more than one battery is essential. What is the difference between the various resistance levels of the atomizer heads? 1.8, 2.4, 2.8 are measures of the atomizers resistance. In layman's terms it's a measure of strength, 1.8 being strongest, 2.4 medium and 2.8 low power. Increased power would mean more vapor, flavor and throat hit. Yes, all of the cartomizers are refillable with the eLiquid with the exeption of the Express pre filled cartridges. We recommend refilling cartridges over purchasing pre-filled cartridges as it is more economical and environmentally friendly. Most parts are interchangeable between different models. The Express cartridges are designed for the Express batteries only. The Jet cartomizer is designed for the jet battery only. However, adapters are available for certain models which could make this possible. My atomizer is leaking into the battery (or MOD), is this normal? Well, that depends. If you removed the atomizer from your battery (or MOD) and found a small amount of liquid in the battery contact, that is perfectly normal. Please do not be alarmed. All atomizers will leak from the air channel into the battery. However, the entire atomizer, tank or cartridge should not be emptying out into the battery. We suggest cleaning the battery contacts periodically and always before charging the battery. What are manual and auto batteries? Auto/Automatic- Batteries with vacuum switches that are activated by inhaling. These batteries have a hole in the center-post so that air can get into the switch. They are easier to use and convenient because they can be used hands-free. Manual button- These batteries have a button which is depressed to activate. These batteries do not have the "air-hole" and are usually sealed to protect from liquid damage. Manual button batteries can last twice as long as auto batteries in-term of lifespan. What is an Oil Atomizer? An Oil Atomizer is a prebuilt atomizer head intended for use with Oil Concentrates and features a slightly different structure than a conventional replacement atomizer head. These coils are exclusively intended for use with Oil Concentrates as opposed to E-Liquids. What is the VaporFi Home Delivery? *Active participation in the Home Delivery Program is a requirement for receiving membership benefits. How does the Home Delivery Program work? 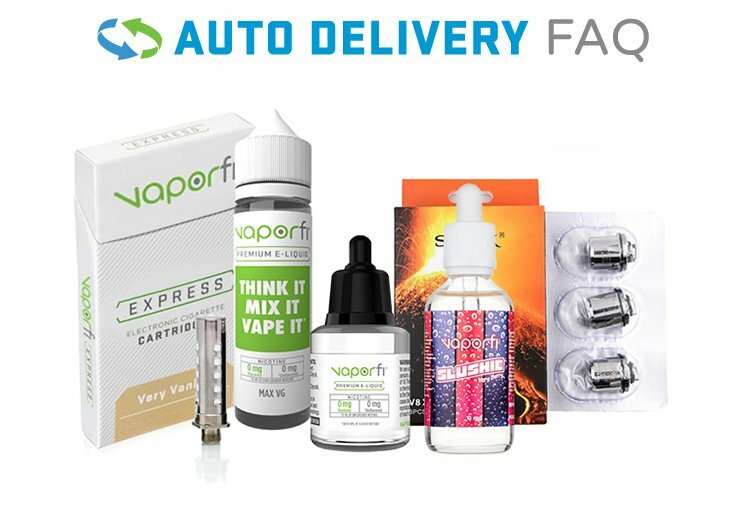 VaporFi’s Home Delivery Program is an OPTIONAL service that enables our customers to save money on e-liquids and cartridge refills while adding the unsurpassed convenience of automatic deliveries (weekly, monthly, quarterly) to guarantee customers always receive their desired supply of products. Participation in the program is entirely optional and can be canceled at any time, however it is free to join and we really encourage all customers to take advantage of all the perks available with it. You are free to modify the frequency or the contents of your shipments at any time. Do I need to sign up for the Home Delivery Program in order to purchase a Starter Kit? No. Home Delivery Program membership is an entirely optional service. However, by enrolling, you will receive the convenience of never running out of your favorite e-liquid or cartridges plus gain access to money-saving special offers throughout the year. You have nothing to lose by enrolling because it is free to join, and the benefits of convenience add up greatly; as do the savings. 97% of our customers choose to enroll in the Home Delivery Program and there is good reason why! How do I enroll in the Home Delivery Program? Very, very easily. All you need to do is make a purchase and complete the opt-in form after you checkout. Or you can just use this enrollment form. That's it... donezo! What if I don’t want my e-liquid or cartridges delivered monthly? Can I set my own frequency? Yes. You are free to choose when you want them delivered and it can be as frequently as you like - it's your call all the way. By default our system is set to every 30 days, so if you want to change it, all you have to do is enter your specific desired intervals during the checkout process. If you decide you want to make a change after your initial order, just email us or call us and we’ll set it up to your specs; should they be every 2 weeks, 6 weeks, 2 months, 3 months, 6 months or anytime in between; again it’s all about pleasing you! You can even pause it if you go on vacation. Who can order from VaporFi.com? Anyone who is of the legal smoking age in his or her respective state; typically at least 18 years old. If you reside in Alabama, New York, New Jersey, Utah & Alaska, the legal smoking age as of 6/2010 is currently 19. Is my personal information and credit card information safe to transmit on VaporFi.com? Yes. We observe many advanced measures to ensure secure transactions and protection of all of your confidential information. All information submitted on our site, including your credit card data, will be processed through PCI secured servers with 128- bit encryption technology. That ensures that your personal information is 128 times more secure than if it were processed in a venue (such as in a restaurant or standard store) where no encryption typically occurs. Where can I buy VaporFi products? You can purchase VaporFi products through our website, as well as through our specialty retail locations. Yes. VaporFi is committed to customer satisfaction, and if you are less than satisfied you are free to return your products within 30 days for a full refund, less shipping and handling charges. Do you offer any type of warranty? Keep calm knowing we have a 30-DAY MONEY BACK GUARANTEE. Don't be plagued by the "what-if's" if you want to try VaporFi products, just do it knowing you won't be forced to keep them if things don't work out. Why can't I enter my VaporFi coupon code? VaporFi Coupon Codes are not accepted during checkout. Alternatively, our online store offers a variety of E-Gift Cards to send to friends and family, delivered to their email immediately after purchase! VaporFi Discounts and Promos are exclusive to our newsletter subscribers and are activated in your inbox for immediate use! To receive special offers and discounts for VaporFi E-Cigarettes and Cartridges, please click here!